New innovation is here. Indeed, technology is expanding seriously in Nigeria and this is good news. Last Month, GLO unveiled and launched their 4G LTE internet service, Glo 4G LTE network Data Plans & Subscription Price, thereby making them to become first to launch world-class nationwide mobile 4G Long Term Evolution (LTE) network in Nigeria. Just after some few weeks GLO unveils 4G LTE internet service in Nigeria, MTN took it as challenge to them. Finally MTN unveils their own 4G LTE internet service, MTN 4G LTE network Data Plans & Subscription Price. 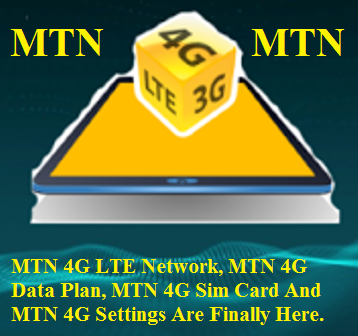 MTN 4G LTE is now available in all states and to use MTN 4G data plan, you must be using a compatible phone and must have swapped your sim for MTN 4G sim card. To make things easier for its subscribers/users, MTN Nigeria makes available a short message code that can be easily used to confirm if your smartphone is compatible or can use mtn 4g network data plans. If compatible, you can then go to a nearest MTN office and get an mtn 4g sim card. How To Check If My Phone Is Compatible With MTN 4G Service? 1. Text 4G to 131. 2. If your smart phone is compatible, you will receive a message that Yello! Your device is 4G ready but you need to upgrade your SIM to enjoy MTN 4G LTE. Please visit the nearest MTN store or partner retailer for a sim swap now. 3. If your phone is not compatible, you will receive a message that Yello! You need to upgrade your SIM card and device to enjoy MTN 4G LTE. Please visit the nearest MTN store or partner retailer to upgrade now. 4. For those with compatible smartphones with MTN 4g network, kindly visit any nearest MTN office and get yourself an MTN 4G Sim Card. If you have confirmed your phone is compatible with MTN 4G network and have gotten yourself a 4g sim card, dial *444# to check and choose mtn 4g plan suitable for you. Below are some of the plans. Have you subscribed to MTN 4G LTE network services? Please share your experience with us using the comment box below. Check out GLO 4G LTE internet service, Glo 4G LTE network Data Plans & Subscription Price. Related Posts: 4G LTE, Data Plans Tips., MTN, MTN Tips. Labels: 4G LTE, Data Plans Tips., MTN, MTN Tips.